A gold LED Moravian star is the perfect addition to your holiday decorations. A 60 inch lead wire lets you hang these brilliant stars almost anywhere indoors or outdoors. Long lasting LED bulbs ensure that this beautiful star will shine brightly for many years to come. 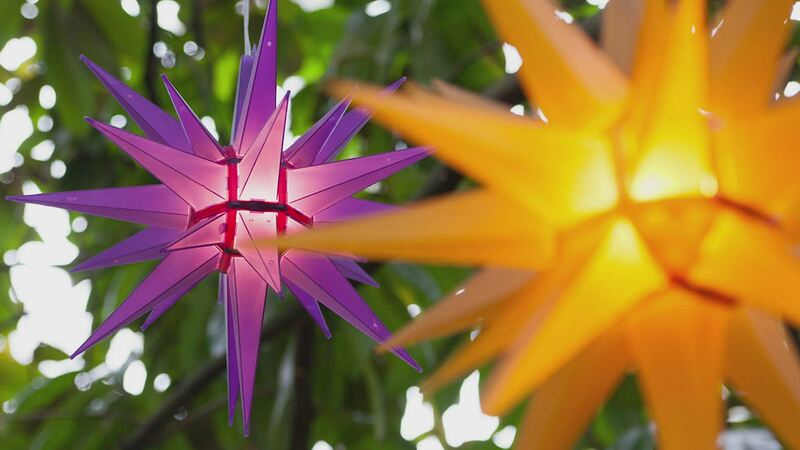 These unique stars will make your light displays stand out and get noticed. A little too expensive for what you get. Isn't exactly what the picture shows. This star was easy to assemble and looks great hanging above my front door. I order two 14" gold Moravian Stars. They came in great time. Once I figured it out, they were easy to put together. We hung them in our two large windows and really love them. Very pretty. Perfect for our needs. The star is very nice. I love these stars! They are easy to assemble and they look fantastic!! Unlike Christmas decorations that must come down after the holidays, these look nice throughout the year!!! Easy to assemble. Solid material to handle outdoor weather display. Looks nice when lit. I love my star. Only complaint is the points fall off with too much handling, but is fine if you keep it in one place. I love mine so much that I'm keeping it up all year! Easy to put together. Well made, not flimsy. A small hook on top makes it easy to hang. The best part is they look stunning on my tree. I bought five and used all of them in one tree in my back yard. One of the stars was broken upon arrival and we had to rig it together with glue and wire.